One way to prepare for the future is to find ways to improve quality of life. Life expectancy in 1900 was about 47 years. 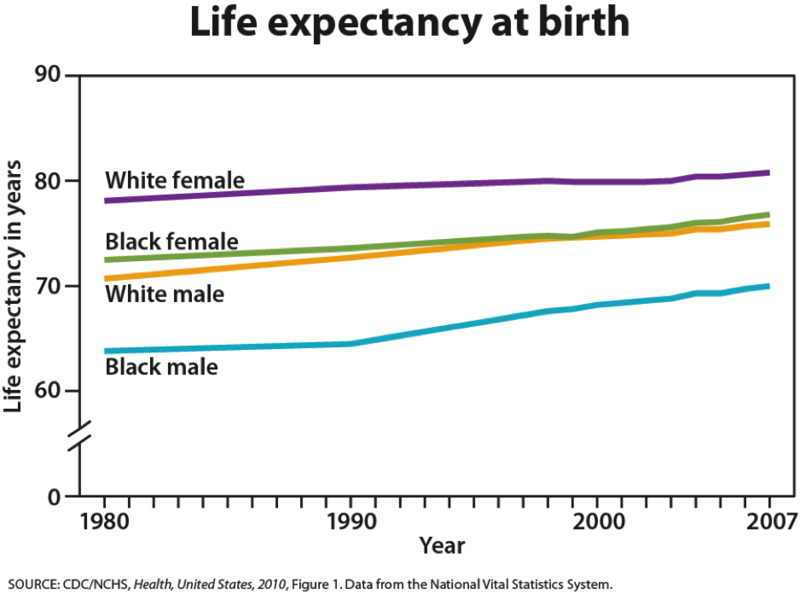 Today, life expectancy for all races is 77.9 (75.4 for males and 80.4 for females.) For whites, life expectancy is 75.9 for males and 80.8 for females. For black males, life expectancy is 70 and is 76.8 for black females (U. S. Census Bureau, 2011). Historic racism or years of living under oppressive prejudice and discrimination can increase the incidence of stress-related illness and contribute to a lower life expectancy. The United States ranks 17th among other countries for its life expectancy for women and 19th for men. Japanese women and Swedish men have the longest life expectancies (He et al., 2005). Increased life expectancy brings concern over the health and independence of those living longer. Greater attention is now being given to the number of years a person can expect to live without disability which is referred to as active life expectancy. When this distinction is made, we see that although women live longer than men, they are more at risk of living with disability (Weitz, 2007). What factors contribute to poorer health? Marriage has been linked to longevity, but spending years in a stressful marriage can increase the risk of illness. This negative effect is experienced more by women than men and seems accumulates through the years. Its impact on health may not occur until a woman reaches 70 or older (Umberson, Williams, et. al., 2006). Sexism can also create chronic stress. The stress experienced by women as they work outside the home as well as care for family members can also ultimately have a negative impact on health. Poorer health in women is further attributed to an increase in rates of smoking by women in recent years (He et als, 2005). The shorter life expectancy for men in general, is attributed to greater stress, poorer attention to health, more involvement in dangerous occupations, and higher rates of death due to accidents, homicide, and suicide. Social support can increase longevity. For men, life expectancy and health seems to improve with marriage. Spouses are less likely to engage in risky health practices and wives are more likely to monitor their husband’s diet and health regimes. But men who live in stressful marriages can also experience poorer health as a result. 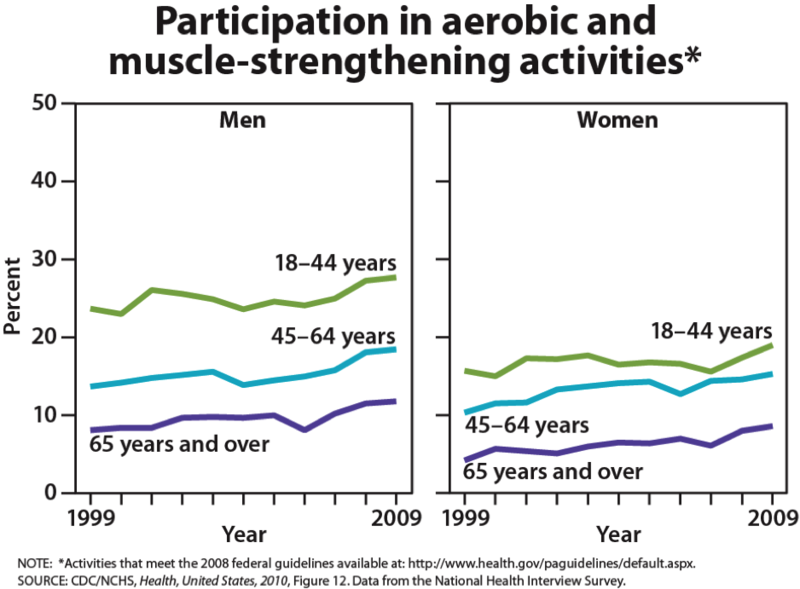 Key players in improving the quality of life among older adults will be those adults. By exercising, reducing stress, stopping smoking, limiting use of alcohol, and consuming more fruits and vegetables, older adults can expect to live longer and more active lives. (He et. als, 2005). Stress reduction both in late adulthood and earlier in life is also crucial. The reduction of societal stressors can promote active life expectancy. In the last 40 years, smoking rates have decreased, but obesity has increased, and physical activity has only modestly increased. Stereotypes about people of in late adulthood lead many to assume that aging automatically brings poor health and mental decline. These stereotypes are reflected in everyday conversations, the media and even in greeting cards (Overstreet, 2006). The following examples serve to illustrate. Of course, these cards are made because they are popular. Age is not revered in the United States, and so laughing about getting older is one way to get relief. The attitudes are examples of ageism, prejudice based on age. Stereotypes such as these can lead to a self-fulfilling prophecy in which beliefs about one’s ability results in actions that make it come true. A positive, optimistic outlook about aging and the impact one can have on improving health is essential to health and longevity. Removing societal stereotypes about aging and helping older adults reject those notions of aging is another way to promote health and active life expectancy among the old. Healthcare providers need to be aware of which aspects of aging are reversible and which ones are inevitable. By keeping this distinction in mind, caregivers may be more objective and accurate when diagnosing and treating older patients. And a positive attitude can go a long way toward motivating patients to stick with a health regime. Unfortunately, stereotypes can lead to misdiagnosis. For example, it is estimated that about 10 percent of older patients diagnosed with dementia are actually depressed or suffering from some other psychological illness (Berger, 2005). The failure to recognize and treat psychological problems in older patients may be one consequence of such stereotypes. Primary aging refers to the inevitable changes associated with aging (Busse, 1969). These changes include changes in the skin and hair, height and weight, hearing loss, and eye disease. However, some of these changes can be reduced by limiting exposure to the sun, eating a nutritious diet, and exercising. Skin and hair change as we age. The skin becomes drier, thinner, and less elastic as we age. Scars and imperfections become more noticeable as fewer cells grow underneath the surface of the skin. Exposure to the sun, or photoaging, accelerates these changes. Graying hair is inevitable. And hair loss all over the body becomes more prevalent. Height and weight vary with age. Older people are more than an inch shorter than they were during early adulthood (Masoro in Berger, 2005). This is thought to be due to a settling of the vertebrae and a lack of muscle strength in the back. Older people weigh less than they did in mid-life. Bones lose density and can become brittle. This is especially prevalent in women. However, weight training can help increase bone density after just a few weeks of training. Muscle loss occurs in late adulthood and is most noticeable in men as they lose muscle mass. Maintaining strong leg and heart muscles is important for independence. Weight-lifting, walking, swimming, or engaging in other cardiovascular exercises can help strengthen the muscles and prevent atrophy. Visual Problems: The majority of people over 65 have some difficulty with vision, but most is easily corrected with prescriptive lenses. Three percent of those 65 to 74 and 8 percent of those 75 and older have hearing or vision limitations that hinder activity. The most common causes of vision loss or impairment are glaucoma, cataracts, age-related macular degeneration, and diabetic retinopathy (He et al., 2005). Hearing Loss is experienced by 30 percent of people age 70 and older. Almost half of people over 85 have some hearing loss (He et al., 2005). Among those who are in nursing homes, rates are higher. Older adults are more likely to seek help with vision impairment than with hearing loss, perhaps due to the stereotype that older people who have difficulty hearing are also less mentally alert. Being unable to hear causes people to withdraw from conversation and others to ignore them or shout. Unfortunately, shouting is usually high pitched and can be harder to hear than lower tones. The speaker may also begin to use a patronizing form of ‘baby talk’ known as elderspeak (See et al., 1999). This language reflects the stereotypes of older adults as being dependent, demented, and childlike. Image others speaking to you in that way. How would you feel? I am reminded of a man dying at home and a hospice worker, on shift for the first time, comes to his bedside and shouts, “Hi, baby. Want me to rub your little feet?” His response was an indignant look of disapproval. Hearing loss is more prevalent in men than women. And it is experienced by more white, non-Hispanics than by Black men and women. Smoking, middle ear infections, and exposure to loud noises increase hearing loss. In summary, primary aging can be compensated for through exercise, corrective lenses, nutrition, and hearing aids. And, more importantly, by reducing stereotypes about aging, people of age can maintain self-respect, recognize their own strengths, and count on receiving the respect and social inclusion they deserve. Secondary aging refers to changes that are caused by illness or disease. These illnesses reduce independence, impact quality of life, affect family members and other caregivers, and bring financial burden. Some of the most prevalent illnesses that cause impairment are discussed below. Arthritis: This is the leading cause of disability in older adults. Arthritis results in swelling of the joints and connective tissue that limits mobility. 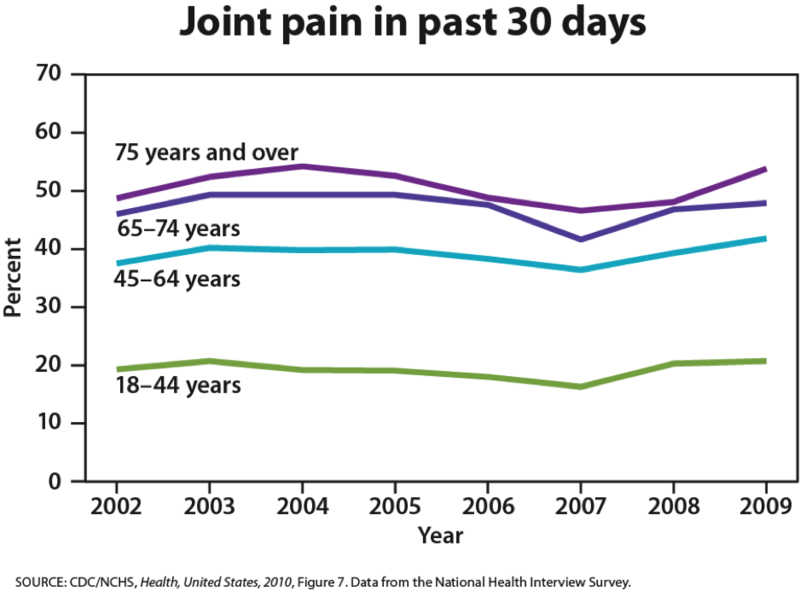 Arthritis is more common among women than men and increases with age. About 19.3 percent of people over 75 are disabled with arthritis; 11.4 percent of people between 65 and 74 experience this disability. Hypertension: Hypertension or high blood pressure and associated heart disease and circulatory conditions increase with age. Hypertension disables 11.1 percent of 65 to 74 year olds and 17.1 percent of people over 75. Rates are higher among women and Blacks. Rates are highest for women over 75. Heart Disease and Stroke: Coronary disease and stroke are higher among older men than women. The incidence of stroke is lower than that of coronary disease. 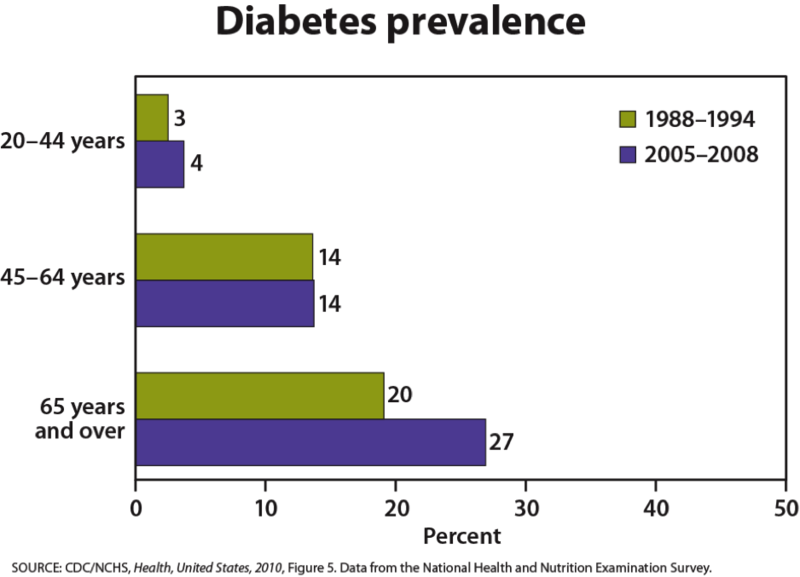 Diabetes: In 2008, 27 percent of those 65 and older had diabetes. Rates are higher among Mexican origin individuals and Blacks than non-Hispanic whites. The treatment for diabetes includes dietary changes, increasing physical activity, weight loss for those who are overweight, and medication (National Institute on Aging, 2011). 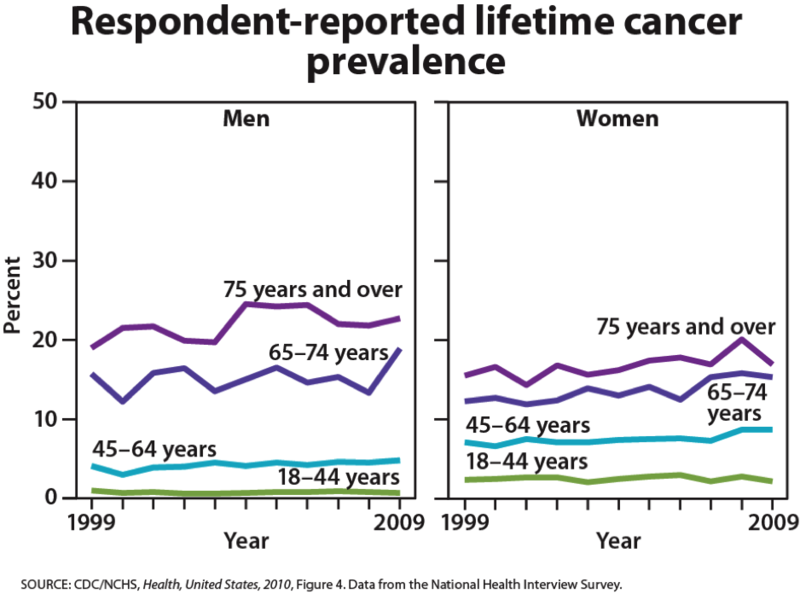 Cancer: Men over 75 have the highest rates of cancer at 28 percent. Women 65 and older have rates of 17 percent. Rates for older non-Hispanic Whites are twice as high as for Hispanics and non-Hispanic Blacks. The most common types of cancer found in men are prostate and lung cancer. Breast and lung cancer are the most common forms in women. Osteoporosis: Osteoporosis increases with age as bones become brittle and lose minerals. Bone loss is four times more likely in women than in men and becomes even more prevalent in women 85 and older. Whites suffer osteoporosis more than do non-Hispanic Blacks. Alzheimer’s disease: Between 2.4 and 5.1 million people in the United States suffer with Alzheimer’s disease (AD) (National Institute on Aging, 2011). This disease is not becomes more prevalent with age, but is not inevitable. This typically appears after age 60 but develops slowly for years before it’s appearance. Social support, and aerobic exercise can reduce the risk of Alzheimer’s disease. As the large cohort of Baby Boomers begins turning 65 in 2011, the number of cases of Alzheimer’s disease is expected to increase dramatically. Where will these people receive care? Seventy percent of AD patients are cared for in the home. Such care can be emotionally, financially, and physically stressful. Most AD patients live 8 to 10 years with the disease and long-term care costs an average of $174,000 per patient (He et al., 2005). Bone mineral is lost. Weight bearing exercise slows this down. There are a number of attempts to explain why we age and many factors that contribute to aging. Genetics, diet, lifestyle, activity, and exposure to pollutants all play a role in the aging process. Cells divide a limited number of times and then stop. This phenomenon, known as the Hayflick limit, is evidenced in cells studied in test tubes which divide about 50 times before becoming senescent. Senescent cells do not die. They simply stop replicating. Senescent cells can help limit the growth of other cells which may reduce risk of developing tumors when younger, but can alter genes later in life and result in promoting the growth of tumors as we age (Dollemore, 2006). Limited cell growth is attributed to telomeres which are the tips of the protective coating around chromosomes. Each time cells replicate, the telomere is shortened. Eventually, loss of telomere length is thought to create damage to chromosomes and produce cell senescence. Free Radical Theory: As we metabolize oxygen, mitochondria in the cells convert oxygen to adenosine triphosphate (ATP) which provides energy to the cell. Unpaired electrons are a by product of this process and these unstable electrons cause cellular damage as they find other electrons with which to bond. These free radicals have some benefits and are used by the immune system to destroy bacteria. However, cellular damage accumulates and eventually reduces functioning of organs and systems. Many food products and vitamin supplements are promoted as age-reducing. Antioxidant drugs have been shown to increase the longevity in nematodes (small worms), but the ability to slow the aging process by introducing antioxidants in the diet is still controversial. DNA Damage: As we live, DNA is damaged by environmental factors such as toxic agents, pollutants, and sun exposure (Dollemore, 2006). This results in deletions of genetic material, and mutations in the DNA that is duplicated in new cells. The accumulation of these errors results in reduced functioning in cells and tissues. Decline in the Immune System: As we age, B-lymphocytes and T-lymphocytes become less active. These cells are crucial to our immune system as they secrete antibodies and directly attack infected cells. The thymus, where T-cells are manufactured, shrinks as we age. This reduces our body’s ability to fight infection Berger, 2005).